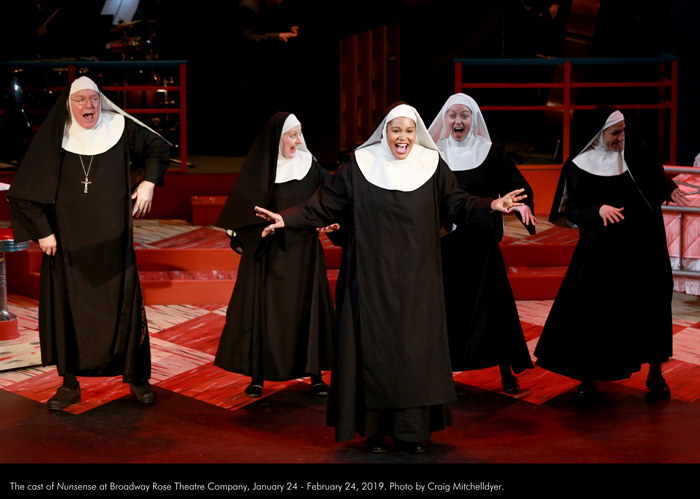 All remaining performances of Nunsense are SOLD OUT! 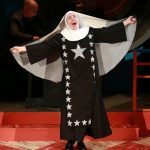 Join the Little Sisters of Hoboken (well, what’s left of them, that is) for a hysterically haphazard variety show to raise emergency funds for the convent. After a bad batch of Sister Julia – Child of God’s vichyssoise killed off fifty-two of the nuns, the survivors emptied the coffers to bury the deceased but ran out of cash before the last few bodies could be laid to rest (don’t worry – they’re in the kitchen freezer). Will their prayers be answered before the health department discovers their secret? 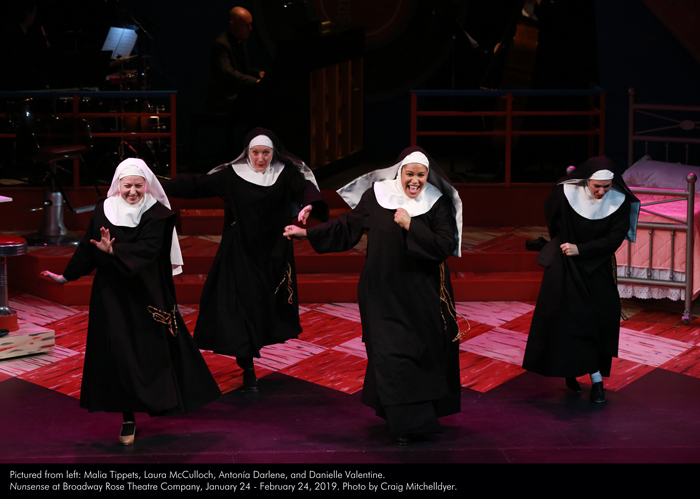 With hilarious talent acts, tongue-in-cheek musical numbers, and help from the audience, Nunsense has blessed theatregoers worldwide for over 30 years and is the second longest-running Off-Broadway show in history. Dan Murphy is the founding managing director of Broadway Rose Theatre Company and occasionally trots the boards both here and around town. 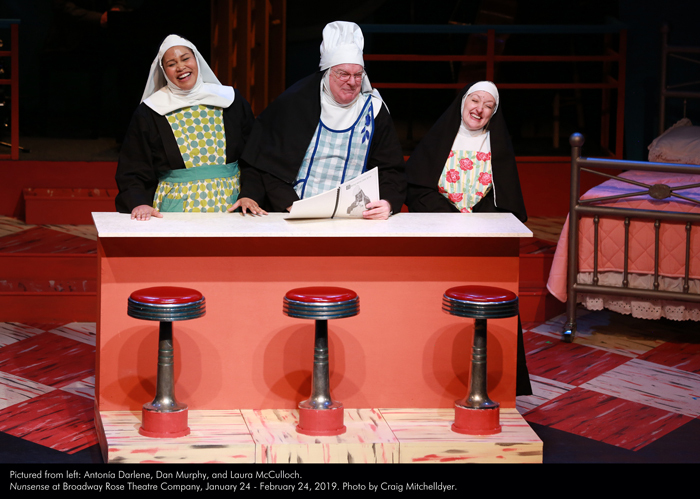 He has performed locally for The Musical Theatre Company, Pixie Dust Productions, Magdelyn Theatre, Well Arts Institute, Oregon Children’s Theatre, Stumptown Stages, and Lakewood Theatre Company. 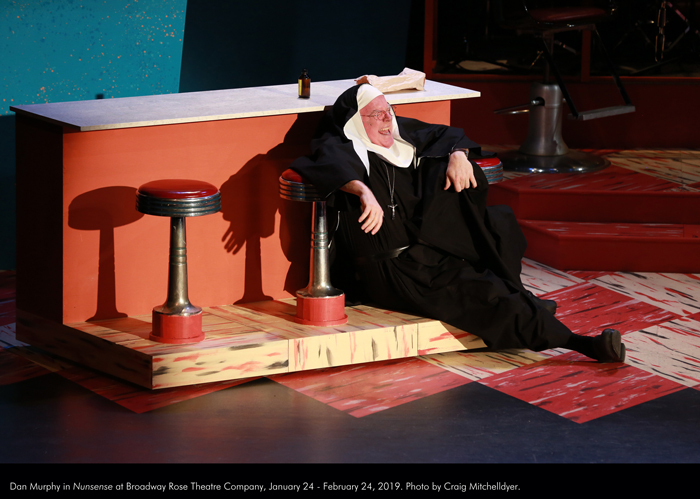 Audiences may recognize him from Broadway Rose’s productions of The Drowsy Chaperone as Man in Chair, Hairspray as Edna Turnblad, My Fair Lady as Alfred P. Doolittle, A Funny Thing Happened on the Way to the Forum as Pseudolus, Gypsy as Herbie, and Guys and Dolls as Arvide Abernathy. He was also recently seen as King Charlemagne in Lakewood Theatre Company's production of Pippin. Originally from New York, Dan has appeared in over 60 movies, television shows and commercials and, although most of his best work has wound up on the editing room floor, he has the pay stubs to prove it. 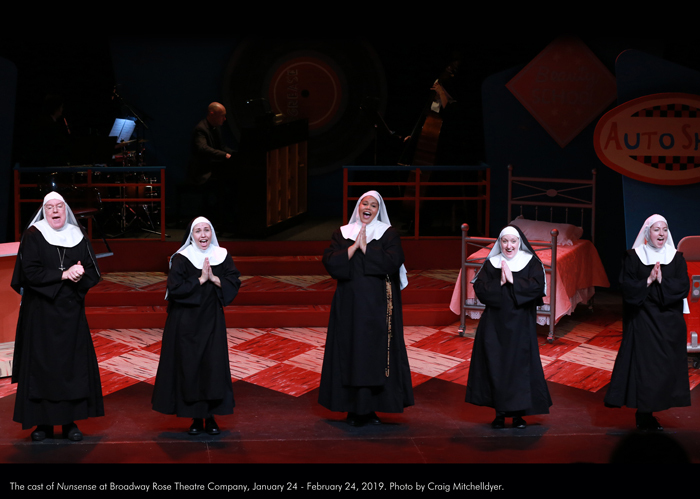 Antonía Darlene is very excited to be back at Broadway Rose where she thoroughly enjoyed her part in Beehive. 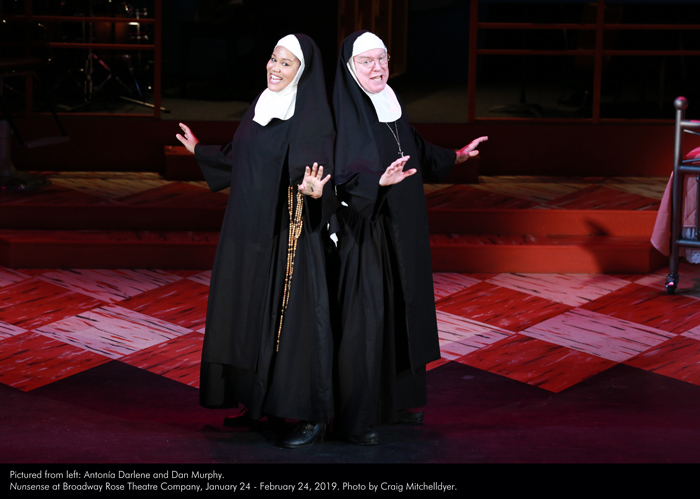 Ms. Darlene, who is a member of Actors’ Equity Association and the American Guild of Musical Artists, has been seen in productions at The Seattle Opera, The 5th Avenue Theatre in Seattle, The Village Theatre in Issaquah, Tacoma Musical Playhouse, and Harlequin in the South Sound. She's been in Showboat, Aida, Porgy and Bess, The Music Man, Hairspray, Cinderella, and The Color Purple. Some of her favorite roles include Rusty in Footloose, Esmeralda in The Hunchback of Notre Dame, Deena Jones in Dreamgirls, Joanne in Godspell, Joanne Jefferson in Rent, and Charlaine in Ain't Misbehavin'. Danielle Valentine is thrilled to be back at Broadway Rose with such a dynamic cast. 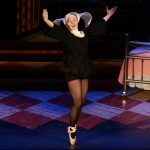 You may have seen her here in 2017 as Tessie Tura in Gypsy. 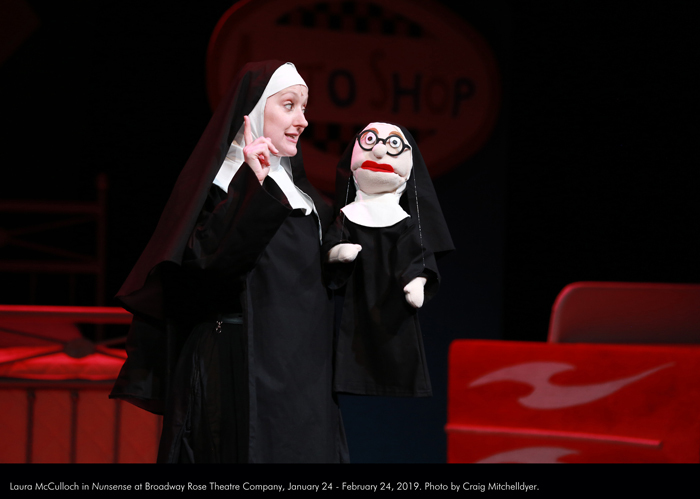 Other favorite roles include Inga in Young Frankenstein and Velma in Chicago. Danielle holds a degree in music performance which carries over onstage and in her passion for working with youth in music and theatre. Laura McCulloch hails from Melbourne, Australia where she studied musical theatre at the Victorian College of the Arts. 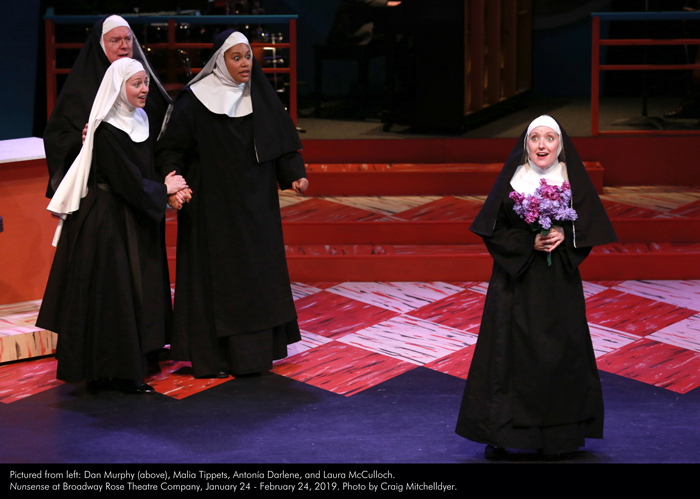 She followed the love of her life to Portland in 2016 and is grateful for his unwavering love and support and to the theatre community for welcoming her with open arms. Some of her most beloved roles to date are: Jennyanydots U/S Grizabella and Jellylorum in Cats (Australasian Tour), Rosie in Mamma Mia! at Broadway Rose, Beatrice O’Leary in Your Holiday Hit Parade at Broadway Rose, Christine Daaé in Phantom at Stumptown Stages, Alexi Darling in Rent at Greenwich Theatre, London; Felicia Lipschitz in A Class Act at Landor Theater, London; and lead production singer aboard the MS Prinsendam and MS Rotterdam in the Holland America Line. 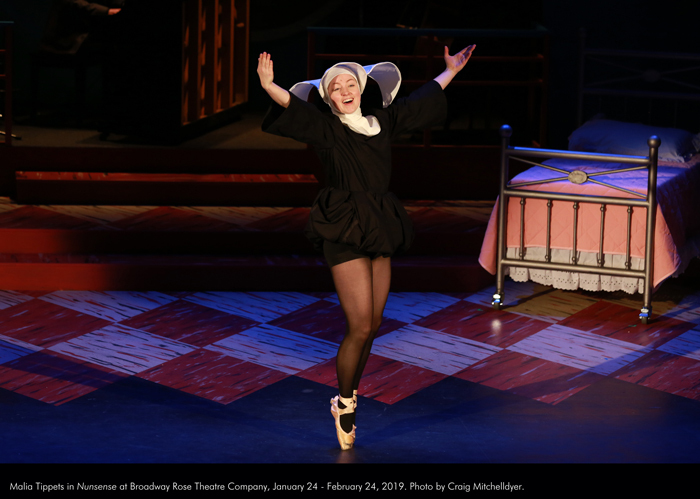 Malia Tippets is thrilled to be back on the Broadway Rose stage. Holding a degree in theatre performance from Marymount Manhattan College, she spent her college years performing in New York and went on to tour the nation in the mega musical Evita as Eva Peron. Returning to New York, she was featured in the “Town Hall: Rising Stars of Broadway” concert. She spent two years in Japan performing as Elphaba in the Universal Studios production of Wicked before returning to Portland. Favorite Portland credits include Fly By Night (Daphne), Carrie: The Musical (Carrie White), Anything Goes (Hope Harcourt) and Heathers: The Musical (Veronica Sawyer). 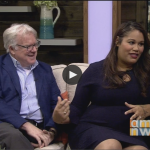 Malia gives thanks to Dan and Sharon for fostering love of the arts in our community and beyond. 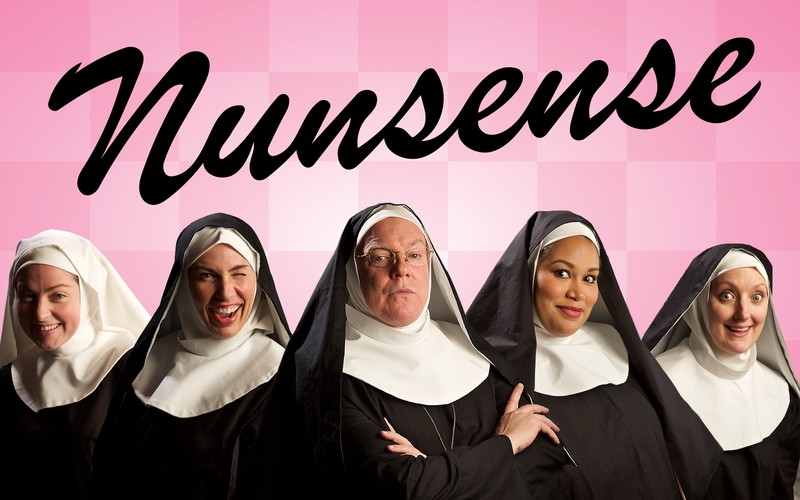 You don’t have to be Catholic to get a kick out of Nunsense. 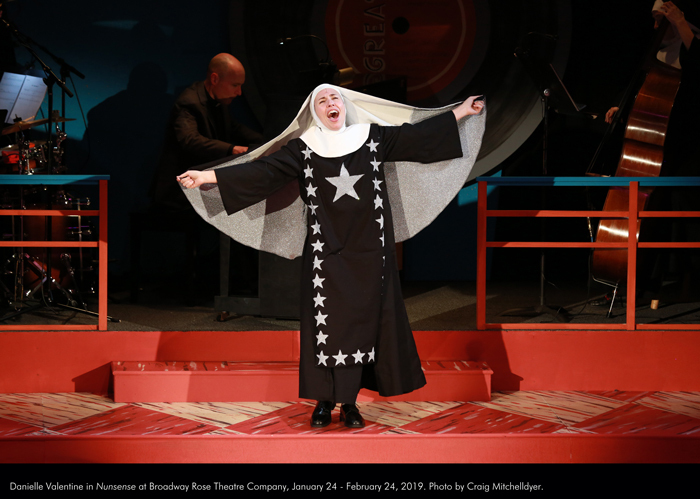 What started as a line of greeting cards inspired a cabaret show that ran for 38 weeks before the concept was eventually expanded into a full-length musical, all created by Dan Goggin. 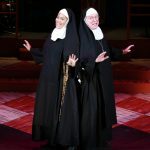 When the original Off-Broadway production opened in December of 1985 it ran for 3,672 performances and became the second-longest-running Off-Broadway show in history (after The Fantasticks). This time around I’m delighted to be sitting in the director’s seat, and we’ve got a ton of talent working on this show. I have no doubt that you’ll have a great time and leave the theater chuckling and smiling at the end of the show. The whole thing is pretty silly, so its success depends on an amazing cast, who can land the jokes and the songs. 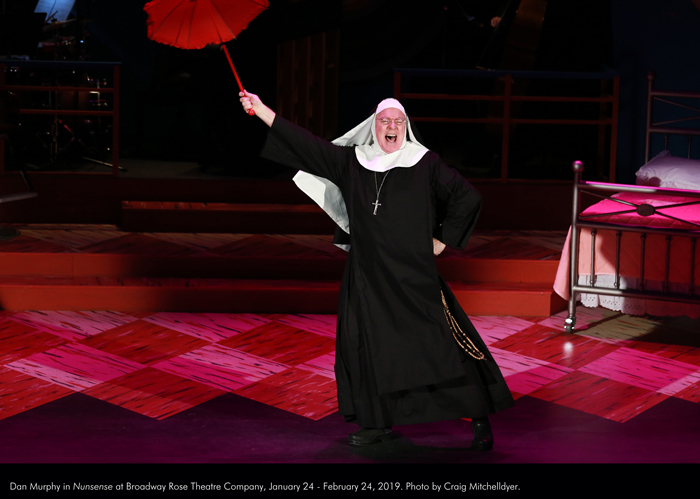 Fortunately, that’s exactly what Broadway Rose has… Read more. 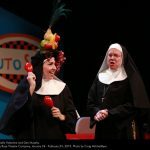 Be prepared for excellent singing, dancing, and plenty of jokes of the ecumenical persuasion, not to mention a ballerina, and a trash-talking puppet… Read more. 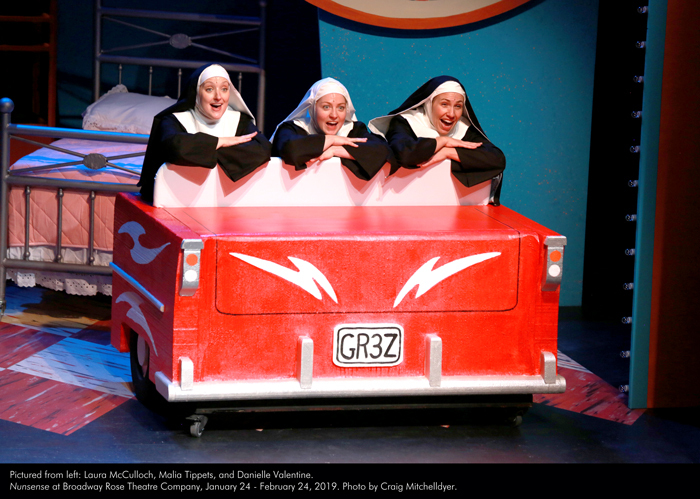 Broadway Rose Theatre Company’s production of Nunsense is a really, really good show… utterly charming, witty, and flat-out hilarious…Read more. 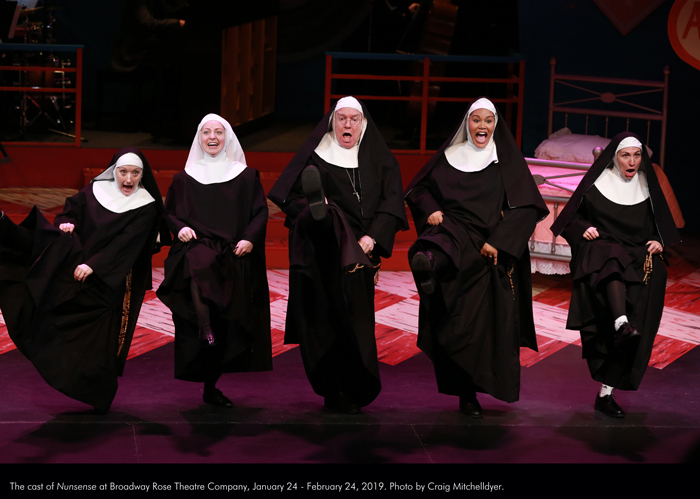 …there’s so much joy, joy, joy in the heart of “Nunsense” it’s still as deliriously intoxicating as undiluted communion wine… Read more. 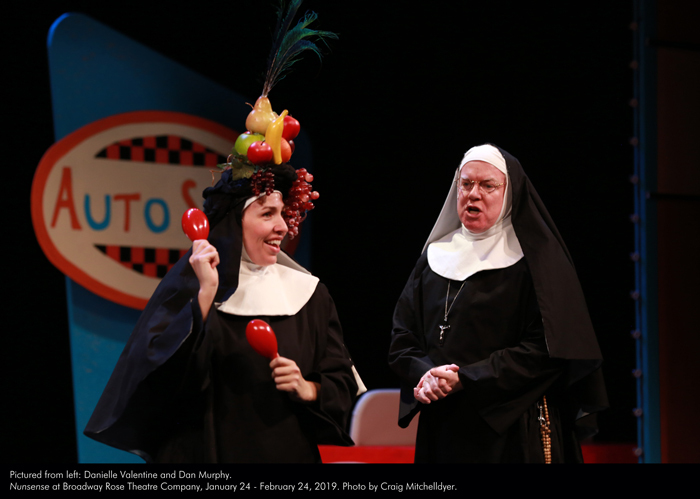 Nunsense co-stars Dan Murphy and Antonía Darlene sat down on AM Northwest to discuss the show that will keep you laughing from start to finish… Watch now. This isn’t the first drag performance for Dan Murphy; maybe it’s becoming a habit… Read more. 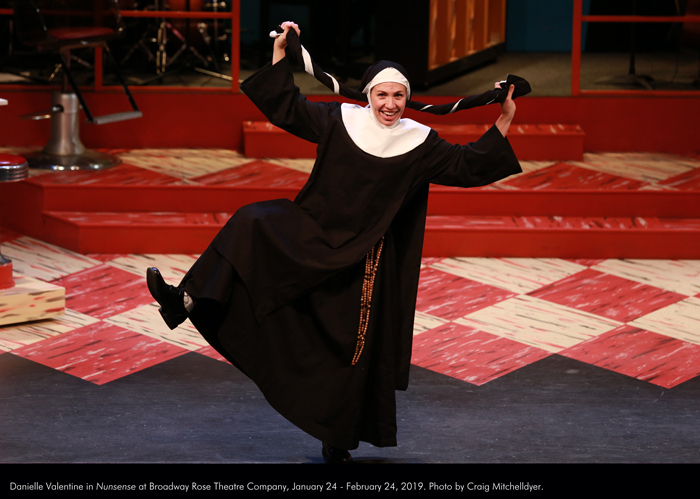 "Nunsense" at Broadway Rose Theatre Company, January 24 - February 24, 2019. Photo by Craig Mitchelldyer.